A Crookes tube is an experimental device developed by William Crookes. It is a glass tube that has electrodes within it and a target. Most of the air is evacuated from the tube. Electricity is applied to the electrodes within the tube. Thus, energy passes from one electrode to the other, both of which are within the glass tube. A target is also within the tube so the electrical glow that the tube produces is effected by the target. 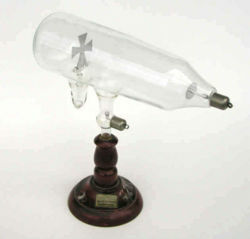 Crookes used a cross shape for the target, thus demonstrating that electrical activity flowed in straight lines from one electrode to the other. A demonstration of the principle can be viewed here. At one time this was high science, and Crookes tube was used by scientists who followed him as they proved additional principles with electrical energy. This page was last modified on 2 October 2007, at 19:47.